What started ten years ago as a health surveillance system to monitor chlamydia is being celebrated today as one of the pillars of Australia’s strategic response to sexually transmitted infections (STIs), and blood borne viruses (BBVs). The Australian Collaboration for Coordinated Enhanced Sentinel Surveillance of Blood Borne Viruses and Sexually Transmitted Infections (ACCESS) also plays an important role in Australia’s efforts to meet World Health Organization and UNAIDS goals for HIV and hepatitis elimination by 2030. A collaboration between Burnet Institute, the Kirby Institute and the National Serology Reference Laboratory, ACCESS was conceived in 2008 to monitor chlamydia, which is commonly asymptomatic so can often go undetected. Its success prompted an expansion in 2013 to include other STIs and BBVs in New South Wales and Victoria, and a further expansion with Commonwealth funding in 2016 for the monitoring of HIV, viral hepatitis and STIs in every state and territory. ACCESS now receives data from 122 sexual health clinics, general practices, drug and alcohol services, hospitals and pathology laboratories, and has been a vital component of Australia’s largest HIV pre-exposure prophylaxis (PrEP) implementation trials. Burnet Deputy Director, Professor Margaret Hellard regards ACCESS as more important and relevant today than when she helped to set it up a decade ago. “Back then we knew it would be important to monitor blood borne viruses and STIs, but with significant changes and the setting of elimination goals, ACCESS enables us to monitor and evaluate Australia’s success in achieving those targets,” Professor Hellard said. 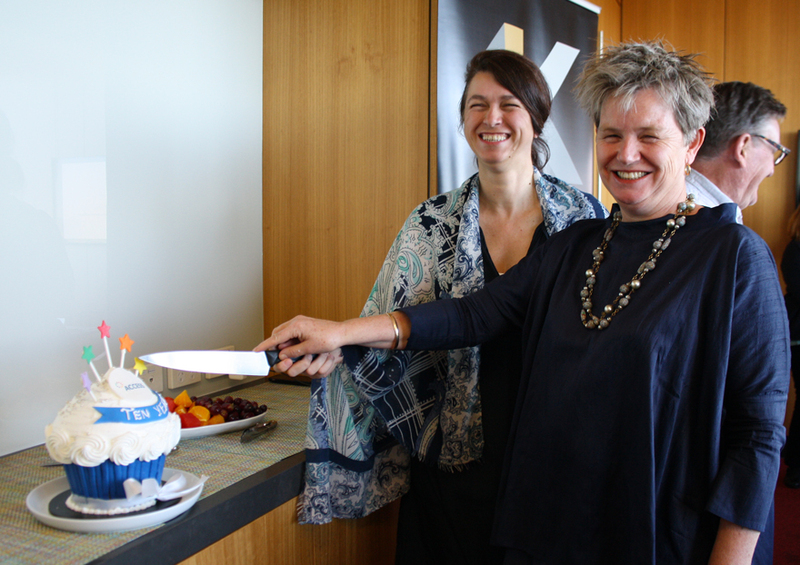 Professor Rebecca Guy, Kirby Institute and Professor Margaret Hellard, Burnet Institute, cutting the ACCESSS 10th Anniversary cake. Head of Kirby Institute’s Sexual Health Program, Professor Basil Donovan said it’s been encouraging to see ACCESS grow into a national network incorporating over 120 sites. “The data we can collect from the breadth of sites in the network enhances our ability to contribute robust data to support and inform public health policy,” Professor Donovan said. In the era of new highly effective medications for hepatitis C, ACCESS has and will continue to play an important role in evaluating the impact of these important drugs through the Eliminate C (EC) Partnership in Victoria, and more recently through Burnet's grant with the Ramsay Foundation for EC Australia. “If we're going to end HIV and eliminate hepatitis B and C in Australia by 2030, as well as reduce the impact of sexually transmitted infections for all Australians, it's important that we have clear programs to address those tasks,” Professor Hellard said. Find out more, visit the ACCESS website for publications and reports featuring the ACCESS data.